Adam Karim (Sajit Khan), Assad Zaman(Saleem Khan), Dharmesh Patel (Abdul Khan), Salma Hoque (Meenah Khan) and Simon Nagra (George Khan) join the previously announced comedy award-winning actress Pauline McLynn (Ella Khan) and original West End cast members, Ashley Kumar (Tariq Khan) and Darren Kuppan (Maneer Khan) to complete the casting of the Khan family in the national tour of Ayub Khan Din’s critically-acclaimed play East is East. The Khans are joined by Kammy Darweish(Mr Shah), Sakuntala Ramanee (Mrs Shah) and Sally Bankes (Auntie Annie). East is East, which was part of Jamie Lloyd’s second Trafalgar Transformed season, is directed by Sam Yates, and will embark on a 14 week National Tour from 11 June 2015, commencing at Theatre Royal, Brighton.East is East is designed by Tom Scutt, with lighting by Richard Howell and sound and music by Alex Baranowski. 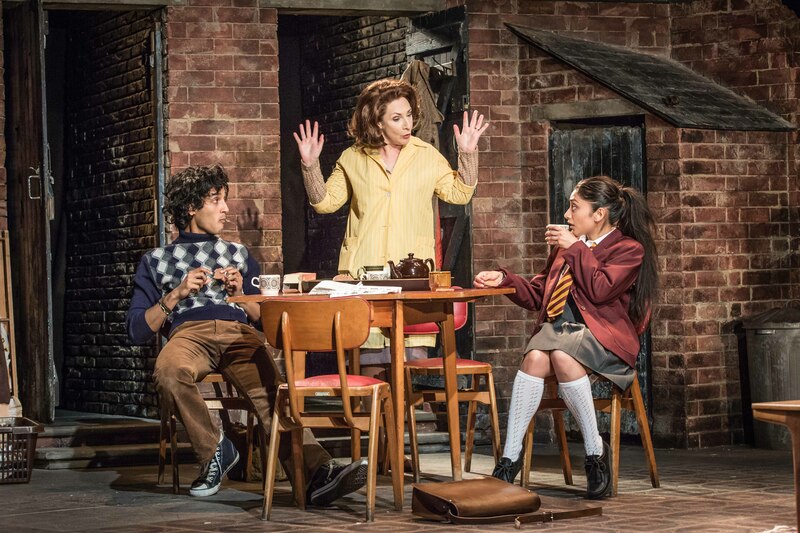 Other confirmed venues for the East is East National Tour include the Waterside Theatre, Aylesbury (22-27 June), New Victoria Theatre, Woking (29 June – 4 July), Churchill Theatre, Bromley (6-11 July), Princess Theatre, Torquay (13-18 July), Regent Theatre, Stoke (20-25 July), Theatre Royal, Nottingham (27 July – 1 August), Grand Opera House, York (3-8 August), Theatre Royal, Glasgow (10-15 August),The Alhambra Theatre, Bradford (31 August – 5 September), Sheffield Lyceum (7 September – 12 September), Bath Theatre Royal (14 September – 19 September) and Oxford Playhouse (21-26 September). Pakistani chip shop owner George Khan - "Genghis" to his kids - is determined to give his children a strict Muslim upbringing in 1970s Salford. Household tension reaches breaking point as their long-suffering English mother, Ella, gets caught in the cross fire - her loyalties divided between her marriage and the free will of her children. East is East, Ayub Khan Din’s semi-autobiographical account of British Asian life in the 1970s and the clash of cultures between a multi-cultural family growing up in Salford, is a play that continues to resonate and provoke discussion. Starring award-winning actress Pauline McLynn (Father Ted, Shameless and EastEnders) as Ella and a host of the finest British acting talent completing the Khan family and friends, this critically acclaimed production of a modern comedy classic promises to be unmissable.